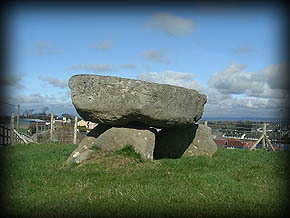 Known locally as the Dolmen of the Four Maols, this megalithic tomb is not actually a dolmen but a Kist situated on the edge of the town near a railway line. 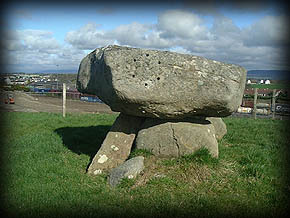 At some stage one of the side-stones has been removed from the kist and left lying close by. This stone is visible in the picture bottom left. This tomb is the largest of its type that I have seen. Folklore: Ardnaree or hill of the execution as it is known plays a part in this story. Guaire Aidhne was King of Connaght but not the rightful heir, the rightful heir was a man named Ceallach who had abandoned the world to become a priest and eventually Bishop of Kilmoremoy (Ballina). 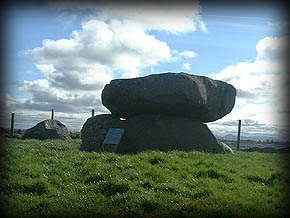 The Brothers of Guaire, The Four Maols, murdered Ceallach whose tuition they were under, they were brought to trial and hanged at Ardnaree then buried on Primrose Hill. Situated: From Ballina Fire Station take the R310 South for Foxford, about 200 metres after the second set of crossroads you take a right turn, the tomb is sign-posted here. The monument is about 250 metres down this road on your left.